This archive holds all posts form July 18, 2016. 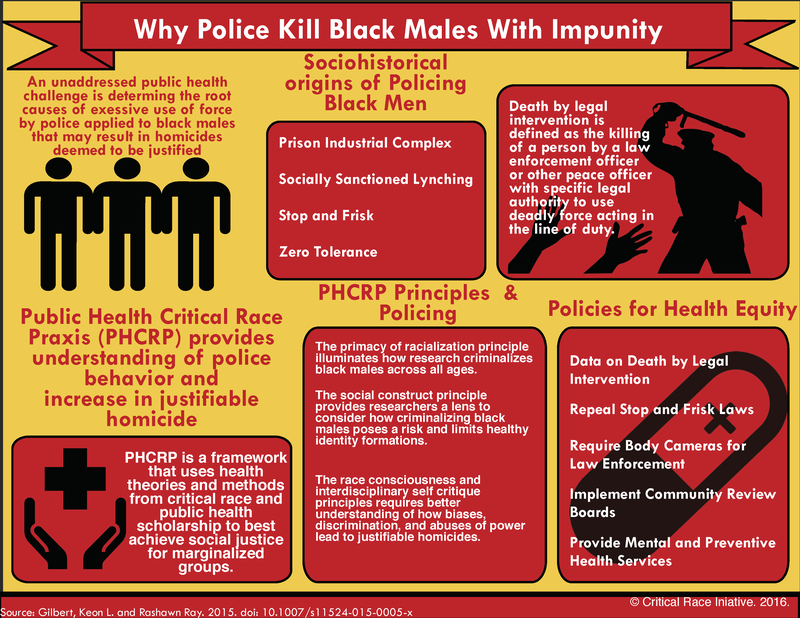 The policing and criminalization of Black men in America has several origins: the prison industrial complex, socially sanctioned lynching, stop and frisk, and zero tolerance, as Keon L. Gilbert and Rashawn Ray point out in their recent article in Journal of Urban Health. This graphic illustrates some of the key ideas in their research. Download this infographic as a PDF. The authors question this legacy of policing in three substantial ways. First, racial stratification leads to unequal life chances due to the way current research criminalizes Black men of all ages. Second, criminalization of their race and gender limits health identity formation for Black men. Lastly, prejudice and racism lead to a negative experience for Black men within the criminal justice system. Thus, Gilbert and Ray use PHCRP to demonstrate how critical race theory offers solutions to build more equitable relations between law enforcement and the communities they serve. Find more research on race and policing here. ~ Melissa Brown is a PhD Candidate in Sociology at the University of Maryland and social media manager for the Critical Race Initiative.